Christmas – the best festive holiday time of the year with bright twinkling lights, get-together’s, sparkling surprise gifts making the season more special for everyone. 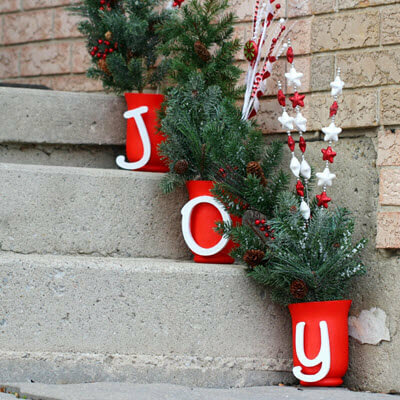 Spread the joy of Christmas everywhere at home both indoors and outdoors. Increase the festive celebration mode by decorating right from outdoors. Hang on to these amazing ideas that would grab everyone’s attention and make them go speechless in its astonishing beauty. LED snowflakes and stars look bold and bright along a fence, among tree branches, in patio creating an extremely impressive display. The beauty of these snowy pretty white flakes and stars is breathtaking in its looks. These are superior whether protected and is energy efficient making it the best décor piece for the entire season. Pre-lit Christmas trees are the best ones to brighten up the outdoor with full holiday mood. 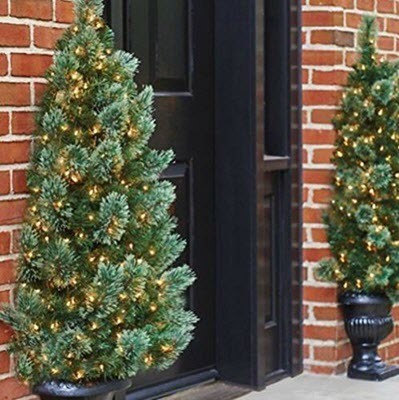 The pre-lit half tree set with clear lights makes your entry way shiny. Can decorate it to your taste with your choice of ornaments and ribbons to make it look more sparkling. 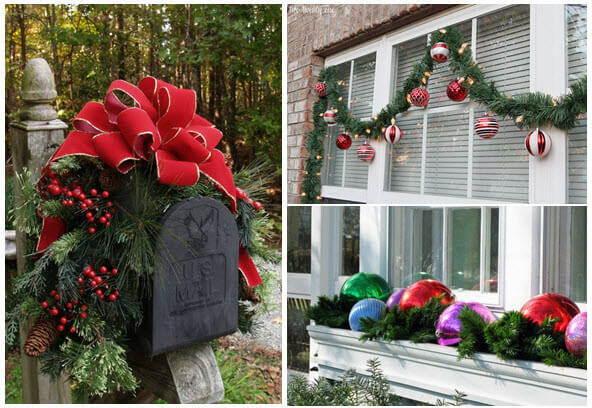 Bring in a lot of Christmas concept related decors to give an amazing look to your yard. 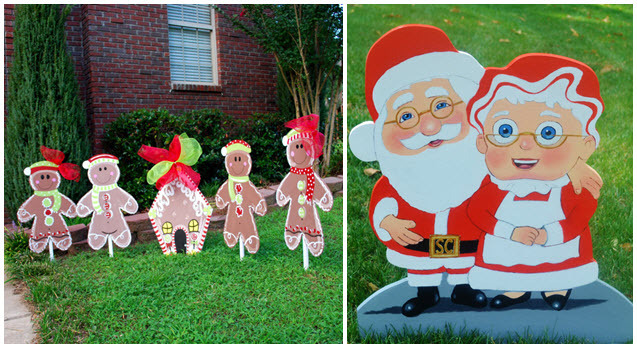 The mom and pop Santa lawn stake, ginger bread family are very colorful and eye-catching that increases the beauty of the place where it is placed. These adorable decors can also be personalized with your family names to make it more special. These traditional red pots look simple but extremely stupendous making your steps more meaningful loaded with joy for the season. Welcome all with positive words at your entrance for the festive season. Can make personalized DIY pot decors which makes an amazing gift for your friend and loved ones. Dress up the window and letter boxes with sparkling ornaments, ribbons and pine cones to make it strikingly beautiful and ready for the season. If your windows are transparent then try hanging lights and stars from indoors to make it look great from outside. Christmas inflatables are awesome stuff that increases the merry mood of the season. Let this be your little one’s choice, coz they are going to have lots of fun with these inflatables. 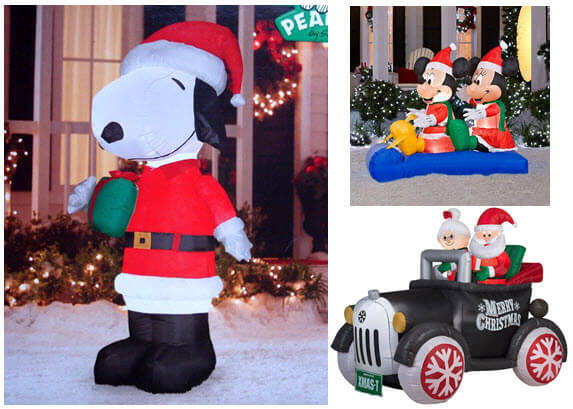 The antique Santa car, LED lighted mickey and mini sled scene, Santa snoopy and many more characters on the list is sure to make the season more colorful to show off your Christmas spirit. The lighted up rattan angel with trumpet, rattan reindeer with sleigh looks great and is best for exterior decorations. The red and white cushions on the sleigh gives an interesting luxurious look to the décor piece. This brings a special attraction to the entryway giving a warm welcome to your guests and friends. Spread holiday cheer to everyone and even to passerby who just take a look at your home. Sparkling patio, garden, door front will increase the happiness to discover the spirit of Christmas. Celebrate the most loving day of the year both indoors and outdoors. Jump, enjoy like a child and get back to the true roots of this beautiful day.